Every now and then I carry out work for no charge, especially when I believe strongly in the project and know that without it something will be lost. The Case of the Missing Doorcase was one such project. This story concerns an early Georgian house that was built in 1716, as indicated by a rainwater head that bears the date. It is a three storey, red-brick building with a hipped plain tile roof. The road front has 4 bays and a moulded wood eaves cornice. The more formal garden (south) front has 5 and a (rebuilt) brick parapet. The windows have gauged brick flat heads and exposed box sashes with what appear to be 19th century sashes. There are raised brick bands between floors. The house is listed Grade II*. Until the 1970s, photographs show that there was a fine doorcase on the road front. This had panelled door linings with a rusticated voussoirred surround and applied fluted pilasters and base. 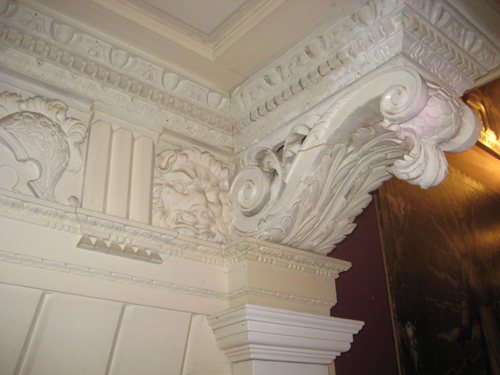 On either side were elaborately carved leaf scroll brackets which supported a flat hood. A Doric frieze of triglyphs and alternating metopes of lions heads and helmets was carried over the door. The town has obviously grown up around the house and it is now in a far-from ideal location. 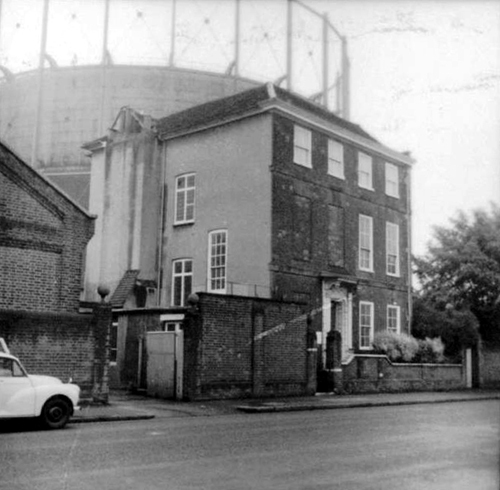 The building was last used as flats but fell vacant due to the uncertainty surrounding the future use of the adjacent land on which is sited a gasometer. 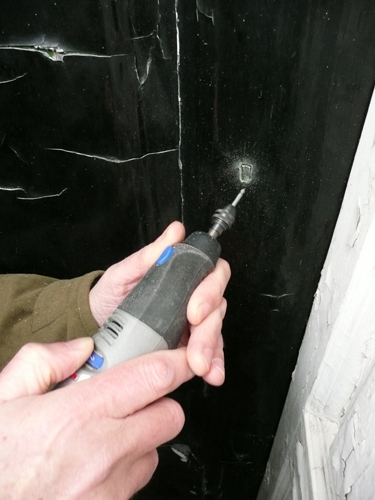 It was not long before it became a target for vandals and architectural theft and at some stage in the late 1990s the doorcase was dismantled and stored inside the building for safekeeping. 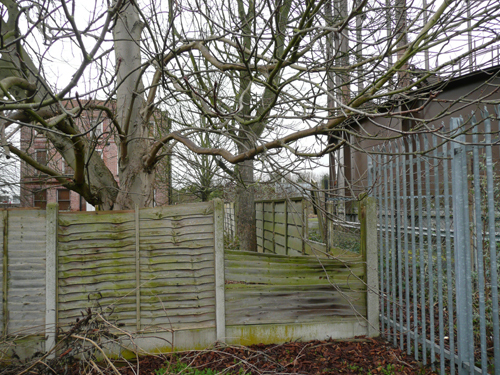 Suzannah Fleming, of The Temple Trust, began to make enquiries about the doorcase in 2009 when it became clear that it was no longer in the house. A year later she came across a very similar doorcase on the website of an architectural salvage yard. In discussion with the owner he confirmed that he had bought various sections of the doorcase about ten years previously, believing it to have come from a house that was being demolished. He had had to rebuild it because of its rotted state, although confirmed that the Doric frieze was original. 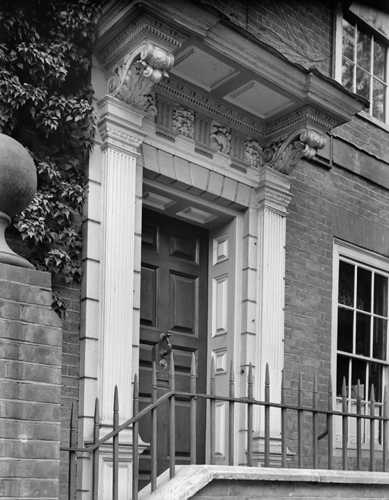 Early 18th century doorcase, photograph by Nathaniel Lloyd (ca. 1915-1933). 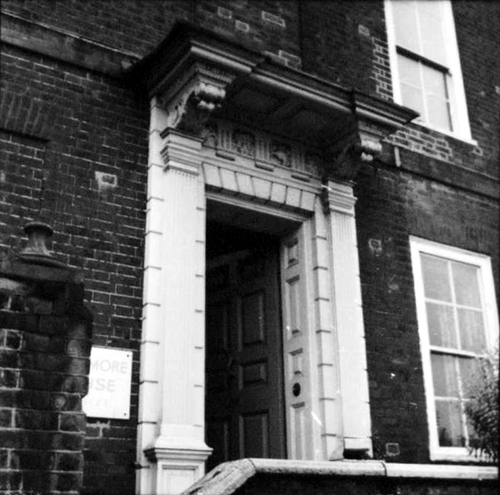 Fortunately, a high resolution photograph had been taken of the doorcase in the first half of the 20th century and using this Suzannah discussed her thoughts with the present owner of the doorcase. He immediately withdrew it from sale while the matter was investigated. 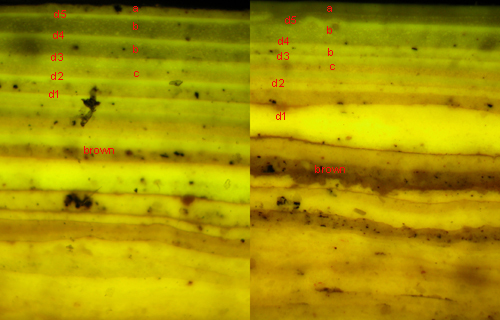 Suzannah then got in touch with me and asked if I thought that an analysis of the paint on the doorcase might help with establishing its provenance. I reasoned that the early layers, at least, should be the same as the lining to the door that had been left on site. I had worked with Suzannah on a number of projects in the past, notably the temple at David Garrick’s house, in Hampton and the temple at Gunnersbury Park, in West London. We arranged to meet at the architectural salvage yard, where the present owner was very happy to have a few samples taken from the doorcase. A week or so later, Suzannah and I travelled to the building itself where further paint samples were removed from elements that had been left behind. 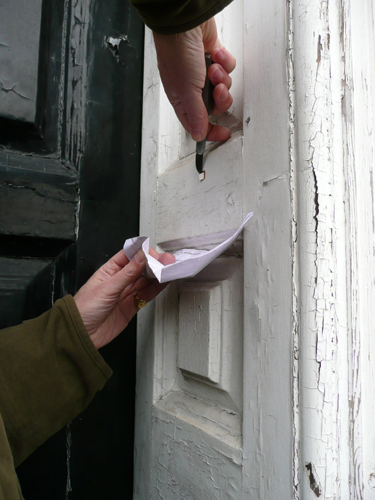 A number of samples were taken from the door lining, which remained in situ. The door itself was sampled. 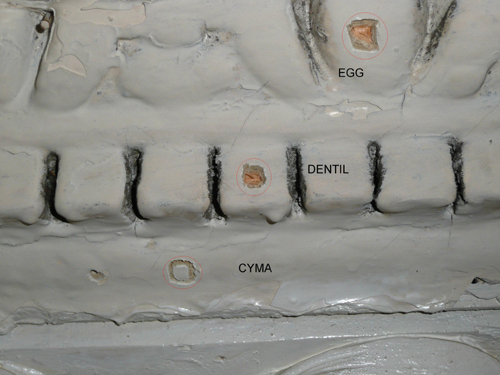 Samples were taken from various elements of the door lining and the doorcase – in particular from those that appeared to be painted in a darker paint in the Nathaniel Lloyd photograph – the egg and dart moulding and the cyma reversa mouldings on the doorcase both appear darker in that photograph, while the dentils were in a paler colour. 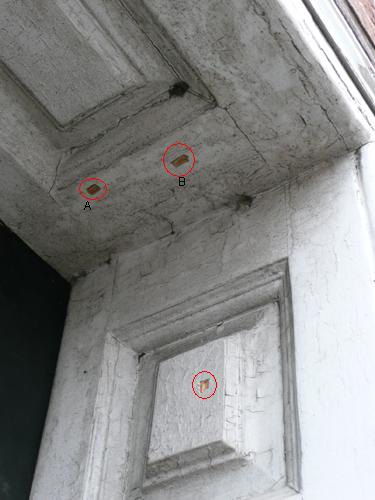 The outer framework of the soffit of the door lining also appeared darker (see A and B in the above photograph). The samples were brought back to the workshop and set in small resin blocks with an identifying number. They were then sawn in half and polished with a succession of progressively finer abrasive papers until a mirror-smooth face resulted. 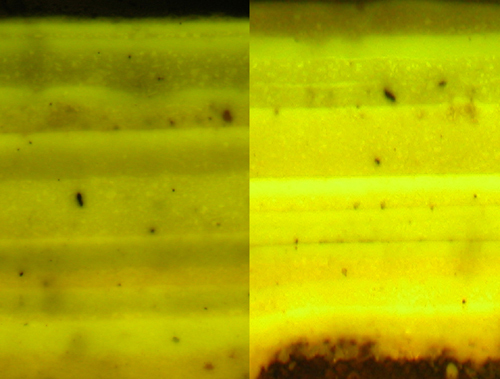 At this stage they were examined under the microscope under plain and also under Ultra Violet light. Comparisons were made between the samples from the doorcase and those from the door lining. c)	Two splits in the R/H scroll. Although it was looking very likely that the missing doorcase had been found, it was only paint analysis that was able to prove the case. While there is little doubt that this particular architectural salvage yard had bought the doorcase in good faith, this sort of information is surely enough to make others think carefully before handling such objects. I am grateful to Suzannah Fleming of The Temple Trust for her doggedness and for asking me to show how paint analysis can answer many more questions that is sometimes supposed. To Gary Butler of Butler Hegarty Architects, who also carried out extensive work on the project for no remuneration. To National Monument Record and Hertfordshire County Council for kindly allowing the use of the early photographs with no charge. I am also grateful to the owner of the architectural salvage yard, who co-operated fully throughout the exercise. It’s reached an interesting stage. The doorcase has been located. I am hoping that the salvage yard will donate it to The Temple Trust. The owners of the building must then show a willingness to tidy the building up and help to give it a future, otherwise the cycle will continue.